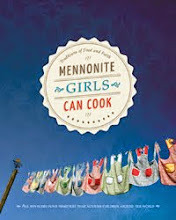 Mennonite Girls Can Cook: Saturday in Norma's Kitchen..making perogies. 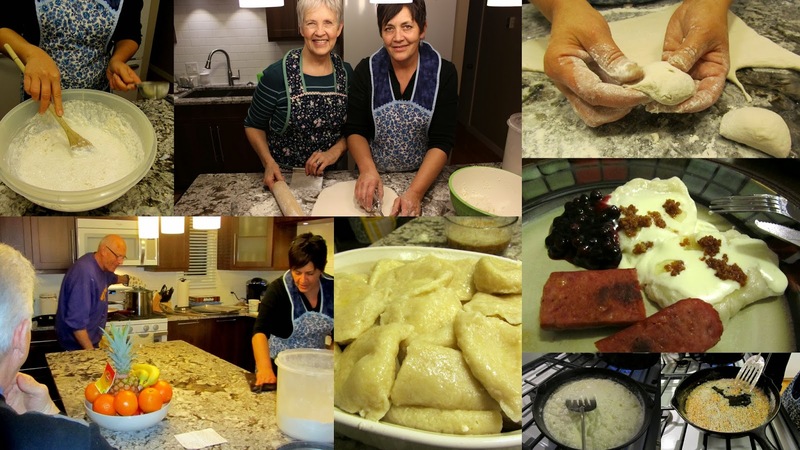 My sister Norma and I often talked about making perogies/varenechi together and after they had their kitchen renovations done she suggested we make them in her kitchen and enjoy a meal together with our husbands. We came happily with camera in hand. Norma mixed and rolled and I pinched perogies. Jack watched over the boiling process and John made sure all was done right, oh and he took photos when I was busy. Norma's Cottage Cheese Perogies, we use the same recipe. Beat together cream, milk, and egg whites. Add salt and flour, 3 cups of flour to begin with then add the rest as needed, knead until the dough is smooth and not sticky. 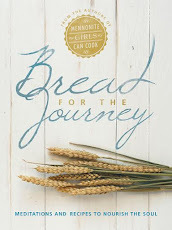 Spread a little flour on the counter and roll out each part of the dough to 1/8" thickness. Cut circles with a 3" biscuit cutter, spoon a tablespoon of filling into the center of the circle, fold over the dough and pinch the edges to seal. I do it this way, my sister has her own method. Place on cookie sheets sprayed with cooking oil. Bring water to boil in large pot, place approximately a dozen perogies at a time in the boiling water. When done scoop perogies out of the pot with a slotted spoon and brush with butter to prevent sticking together. Serve with cream gravy, warm Saskatoon sauce, and farmer sausage. Coleslaw is a very good side dish as well. Mix all together until well blended. I do this by hand. Because that's how Mom always did it. 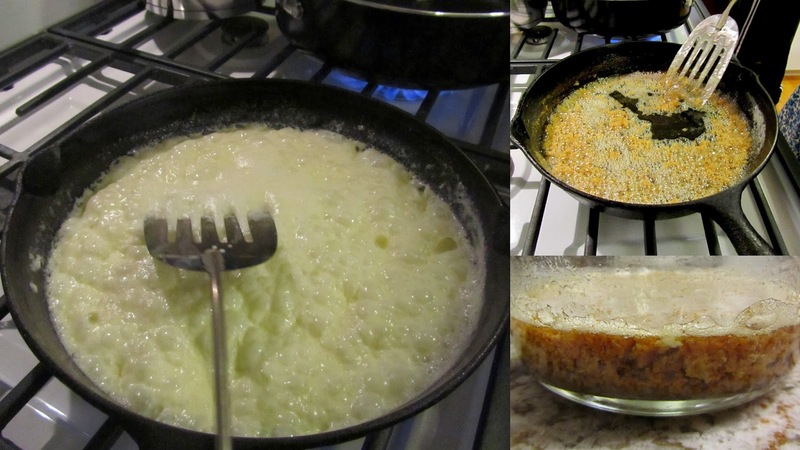 Melt butter in saucepan, add flour and whisk till mixture is smooth. Add the cream slowly stirring constantly until thickened. 2 cups Saskatoon berries or you can use blueberries. We like Saskatoon berries the best for this sauce. In a medium saucepan over medium heat, bring berries and water to a boil. In a small bowl whisk together sugar, cornstarch, and salt. Add to berries and stir constantly until mixture is clear and thickened. My Dad didn't care for the regular cream gravy so Mom would make his favorite kind and when she made it we all wanted some of it as a topping on the cream gravy. It sure tastes wonderful but it does add extra calories. I don't make it but my sister does and they call it Grandpa's gravy at their house. Cook over medium heat stirring constantly until it curdles and turns golden in color. I love handwritten recipes. Don't you? I made perogies for the first time this past Christmas for our Christmas Eve dinner. They were amazing and much simplier to make than I imagined. Now my husband wants me to make them again and again and again!!!!! I used a potato- cheddar cheese mixture to fill them. No more store bought perogies for us. What size are the containers of cottage cheese? Barb, size of containers is 600g. Sorry Barb, for this recipe you would only require 1- 600g container. I normally make double the recipe and then you would use 2 containers. Was going to make cottage cheese perogies for the first time so glad I saw this as I didn't realize about adding the egg. Yet again your recipes and tips come in handy. Thank you so much. I love this post, Betty! What fun...the two of you working together in Norma's kitchen. And I know it is a real treat to sit at her table! I'm recalling the fine time we had there last summer. Thanks Judy! Yes, we definitely had a fantastic sister time making them and then of course the benefits of eating them!!!! Handwritten recipes are wonderful. There's a Polish parish church in my neighbourhood and each fall I visit their bizarre to purchase perogies (pierogi) and cabbage rolls. Every year, I tell myself I'm going to learn how to make both. Thanks for the recipe! I had never heard of serving Vareniki with a 'creamed gravy', how interesting !!! I am the 'chief dough maker' for my local Ukrainian Orthodox church's' food sale and make the dough for thousands of Vareniki very month. We usually just serve them with onions that have been sauteed in butter and topped with cold sour cream. In addition to filling them with a mashed potato/sauteed onion and cheddar cheese mixture, we also fill them with a farmers cheese, egg and sugar mixture. But my personal favorite are the ones filled with what we call "Kapusta". Shredded cabbage, saurkraut and grated carrots, roasted with some oil and salt until golden. They're real stinkers to fill but a delight to eat. I love it! Thanks for the wonderful post. wow that makes me hungry for porgies! !Have to make soon!! I ad a TBLSP of oil to my dough and that makes it very pliable.And I like strawberry (jam or other )as a fruit on top. I have never heard of dry cottage cheese. Do you buy it in a specialty food store? Sometimes called Farmers Cheese. It's a dry 'pot' cheese. I love seeing you girls working together. I love the kitchen reno Norma and Jack. I can just visualize the whole cooking together and now I am homesick to be there with you. I haven't heard of cooking the cream and butter until it curdles either... at least not on purpose. =) Next time.. I can honestly say I meant it to be like that. My Aunt Sarah used to make blueberry vereniche and then served them with a caramel sauce, that she made with 1/4 cup butter, 1 cup of WHITE sugar, which she cooked in a saucepan till it carmelized and turned brown, then would remove from heat and add 1 cup whipping cream slowly, then return to a low heat till it was the right texture. Could also be used on icecream as a topping. What fun, cooking with your sister. The perogies look delicious. Thanks for sharing the recipe! Happy Sunday! My mother would NEVER add flour.. It should be 'cream gravy' & not 'smagis'.. what ever that was. She would also make some perogies with blueberries and even rhubarb. I NEVER liked the dough, so I didnt eat them,, until a few yrs after we were married, a cousin of my husband invited us for supper, and she said.. ' I hope you like perogies, because I promised my husband that I would make his favourite dish'..we never said a thing,, but ate.. I loved the farmer sausage & cream gravy, so I endured as did our 2 young children. Since then I have learnt to enjoy perogies to the extent that when I vol. at the Menn. Herritage Musium in Steinbach, and the livery barn restraunt is open,, ther servers know that when I come in the door, its 4 peogies, 1 sauaage, onions if they have and lots of cream gravy..and I dont count the caleries..just eat & enjoy..I'll walk some of that off as I make my way around the 5 acres with my camera. 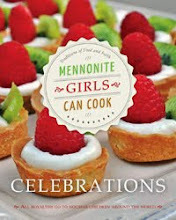 I just knew the Mennonite Girls would deliver when it came to Cream Gravy! I found recipe after recipe using milk and oil....not what I was looking for. I think I'll walk on the wild side and use 18% coffee cream rather than half and half or whipping cream. Thank you for continuing to round out my kitchen endeavours!